Until the middle of the twentieth century archaeologists had a real problem. If they found a bit of pottery, an old coin, or another object while digging up a site, just how old was it? How could they tell if the object had been dropped on the ground thirty years ago or thirty centuries ago? In general, archaeologists knew that the farther they had to dig down to find an object, the older it probably was and that objects found at the same level, or stratum, were close in age. That was helpful when comparing the relative ages of two items, but how could they get the actual age? And how could they compare the ages of items found at sites fifty miles apart? If a society had written records the archaeologists could compare the history against the type of objects they were finding in the ground. A coin bearing the likeness of Augustus Caesar certainly couldn't have minted before Caesar started his reign. Likewise an Egyptian piece of pottery with a design depicting horse and chariot couldn't have been made before the horse was introduced to Egypt. Using these types of clues archaeologists were able to construct a firm history for some societies. By matching pottery between a culture with a known chronology against one without, they could even hazard a guess about historical dates when there were no records. This still left scientists wondering about the age of sites where neither cross-matching of pottery or written records could be used. That was, until the invention of radiocarbon dating. The development of atomic physics in the beginning of the 20th century allowed scientists to understand the phenomenon of radioactivity. Radioactivity results when an atom has a combination of neutrons and protons in its nucleus which is unstable. The atom will expel particles or energy in an attempt to become stable. The expelled energy or particles are the radioactivity. Eventually the atom will change itself into a different substance which may no longer be radioactive. The time it takes for half of the atoms in a sample of radioactive material to decay into another form is known as the "half-life" of the radioactive material. Different radioactive materials may have half-lives that range from a few seconds to hundreds of thousands of years. One naturally-occurring radioactive material found in the atmosphere is carbon-14. As plants and animals use the air, their tissues absorb some of the carbon-14. After they die, though, they no longer absorb the carbon-14 and the material in their tissues starts to decay. In 1949 it occurred to a scientist named Willard Libby that the amount of carbon-14 decay found in an animal or plant could be used as a gauge of how long it had been dead. Carbon-14 has a half-life of 5730 years. That meant if Libby found a sample where the amount of carbon-14 was only half the amount that might be expected in a living creature, he knew the age of it would be about 5730 years. Though archaeologists could not directly use radiocarbon dating on objects such as coins, they could often find organic material (like charcoal from a fire) on the same stratum at a site as the object. In this way the age of the coin, or any other non-organic item, might be inferred from the age of the charcoal. When scientists began to use this method to find the age of sites they ran into a problem. The new radiocarbon numbers didn't seem to jibe with the written records. In some cases they seemed to be hundreds of years off. 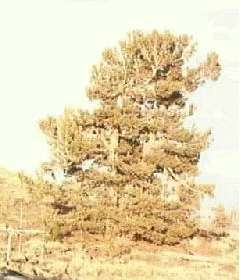 In an attempt to understand the differences, scientists looked towards the bristlecone pines of California. These trees are thought to be the oldest living things on Earth and some have ages of almost 5,000 years. Fortunately the bristlecone pine, like other trees, lays down a growth ring every year. Each growth ring turned out to be a measure of the amount of carbon-14 in the atmosphere during that year. What scientists hadn't understood was that the amount of carbon-14 in the atmosphere wasn't constant, but changed. This meant that the living organisms had different levels of carbon-14 in their tissues depending on the year in which they died. This explained why the early radiocarbon dates didn't match up with the written records. With a record of the amount of carbon-14 found in the atmosphere available through the pines, scientists were then able to calibrate the test and get dates that matched their written records. 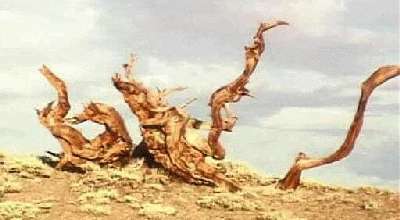 The bristlecone pine is such a tough tree that its wood can survive intact for a long time after it is dead. By comparing the growth rings of living bristlecone pines with ones dead for many years, scientists have been able to extend the calibration chart back about 11,000 years. The radiocarbon dating method has been invaluable in helping scientists date archaeological sites where no other method was available and confirm dates at other locations. Some of these sites include Stonehenge, in England, Mystery Hill, in the United States, and Easter Island in the Pacific. Copyright Lee Krystek 1997. All Rights Reserved.